Strawberries are my favorite fruit and they have been getting their fair share of the spotlight here on A Savory Feast lately. Last week I featured them in my Red, White and Blue No Churn Ice Cream. We can’t forget about these Berry White Chocolate Cups with Mascarpone Cream, either! 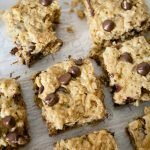 They are absolutely heavenly in this casserole as well! 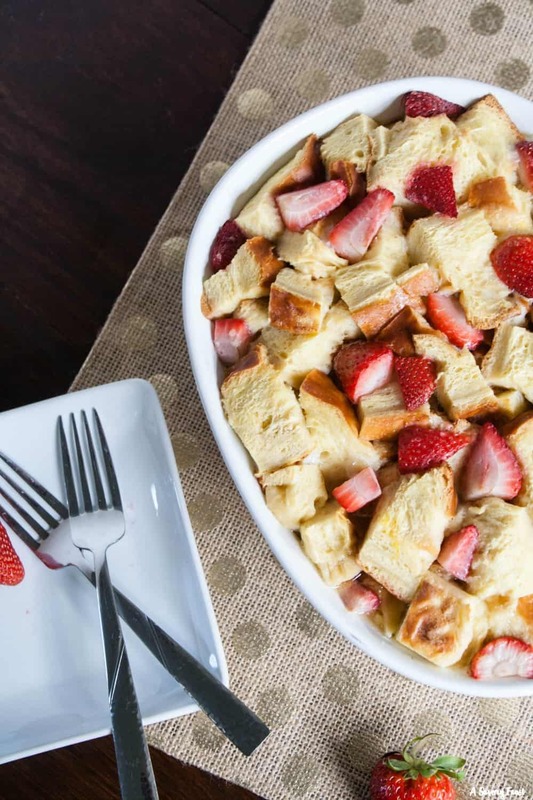 This casserole is made with Challah, or egg bread, which is a sweet bread that is braided. It’s super light and fluffy. 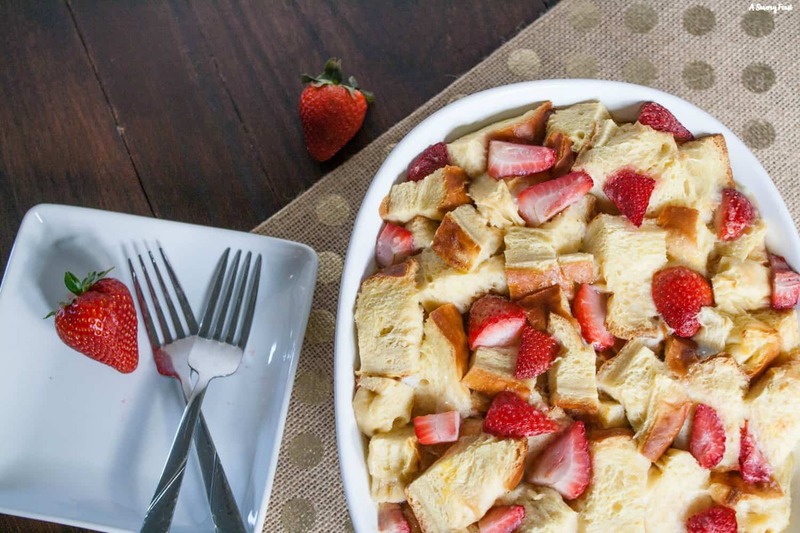 It is the perfect base for this french toast casserole. It absorbs the egg and milk mixture so well. Oh, and there is cream cheese in there as well. 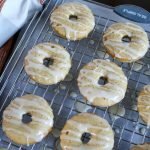 Because everything is better with cream cheese! The last step of prepping this dish is to whisk together maple syrup, butter, eggs and milk to pour over the challah bread. Then put it in the refrigerator overnight. During the night, the bread soaks up the egg mixture so it’s ready to bake in the morning. 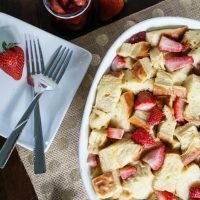 I like to serve this casserole with a homemade, 2-ingredient strawberry syrup. It is made using fresh strawberries and strawberry preserves. When your casserole is in the oven, just heat those 2 ingredients in a saucepan and then drizzle it over each serving of casserole. 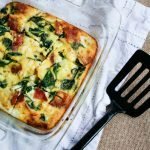 This casserole is a great choice for hosting a brunch. You don’t have to get up early and do a bunch of cooking to get ready for your guests to come over. 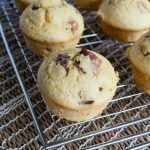 Just 10 minutes of prep work the night before and then stick it in the oven when you wake up! This post was originally posted on A Savory Feast in January of 2014. The images and post have been updated. 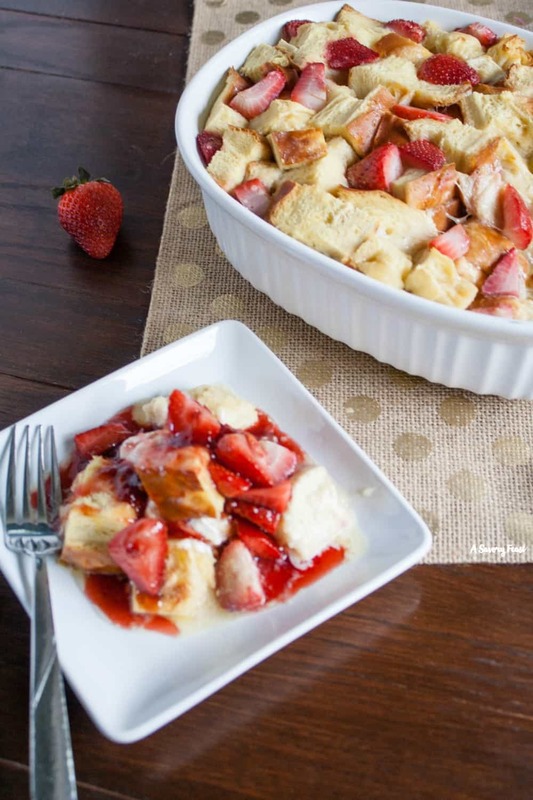 Strawberry Overnight French toast is the ultimate weekend breakfast or brunch dish. 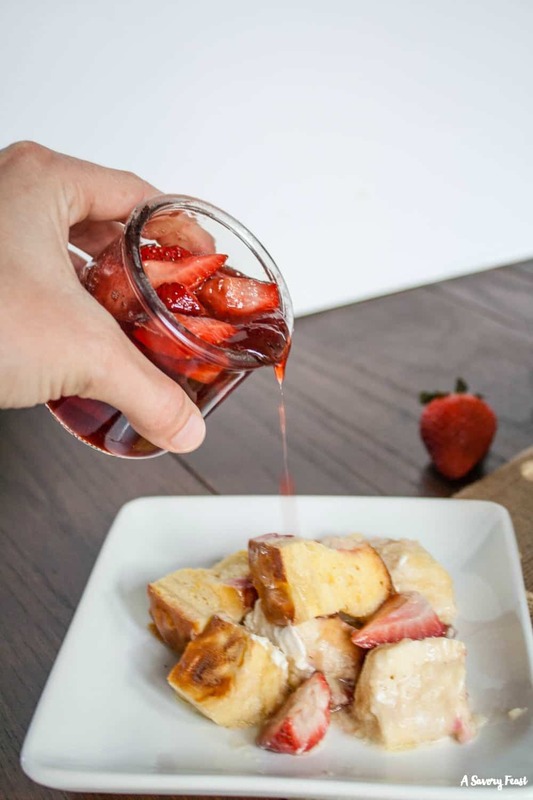 Take 10 minutes to throw all the ingredients together the night before and when you wake up, all you have to do is put it in the oven and make the 2-ingredient strawberry syrup. Arrange half of the bread cubes in a lightly greased pan. A 9x13-inch pan or a 2.5 quart baking dish works well. 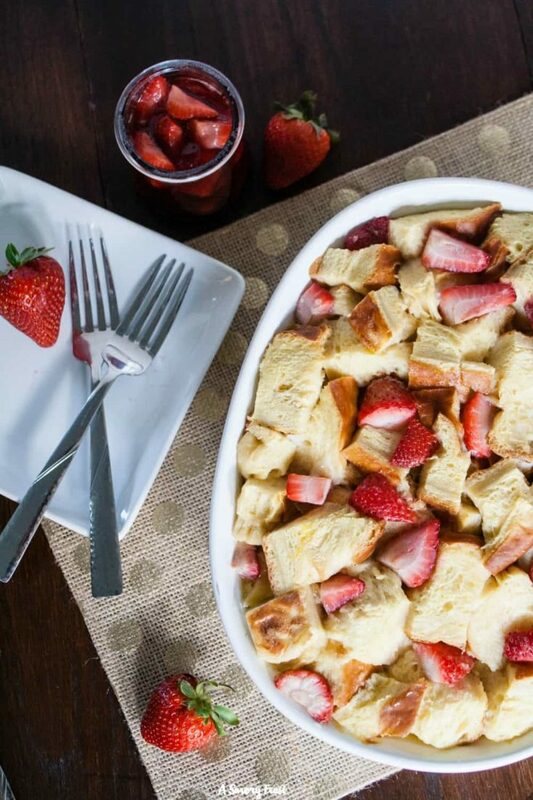 Evenly place the cream cheese cubes, 1/4 cup of the preserves and 1 cup of the strawberries over the bread layer. Top with the remaining bread cubes. Whisk together the melted butter and maple syrup. Whisk in the eggs and milk and then pour the mixture over the bread. Press the bread down a little to be sure it starts absorbing the liquid. Top the casserole with about 1/2 cup of the remaining strawberries. Cover and refrigerate for at least 8 hours. Preheat oven to 350 F. Cover the casserole with foil and bake for 25 minutes. Uncover and bake for another 20 minutes or until the top of the casserole is browned and crispy. The eggs should be cooked throughout. In a small saucepan, heat the remaining preserves and strawberries over low heat until warm. Use as a syrup to serve with the casserole. Oh man, this looks so awesome! I bet the challah makes this so creamy and delicious. Thanks for sharing at Simple Supper Tuesday. Oh this looks so yummy! What an awesome idea! I would love for you to sharing this great post at our WIW Linky Party. I hope you can join us. What an awesome idea! I would love for you to sharing this great post at our WIW Linky Party. I hope you can join us. What a great idea on a classic breakfast. My Husband would love that and would love it with blueberries. Thank you for sharing it on our Four Seasons Blog Hop. Pinning now. 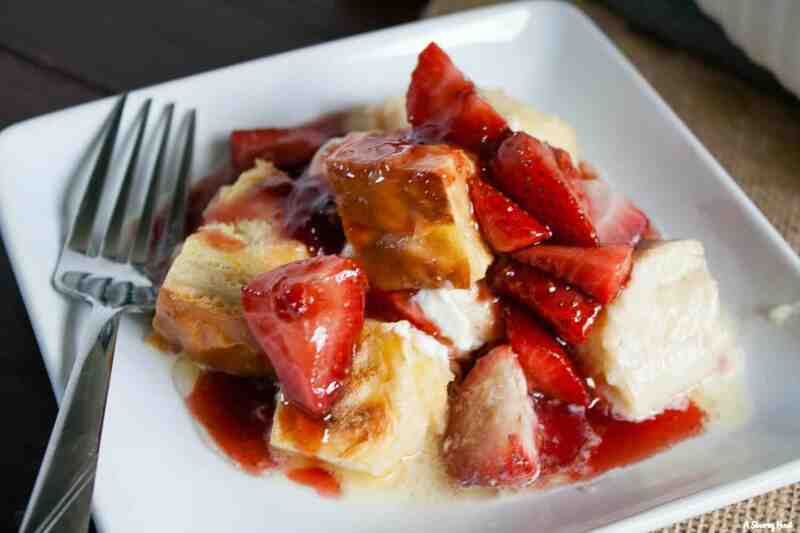 I would just love waking up to this awesome Strawberry French Toast! Thank you so much for sharing with Full Plate Thursday and have a great weekend! 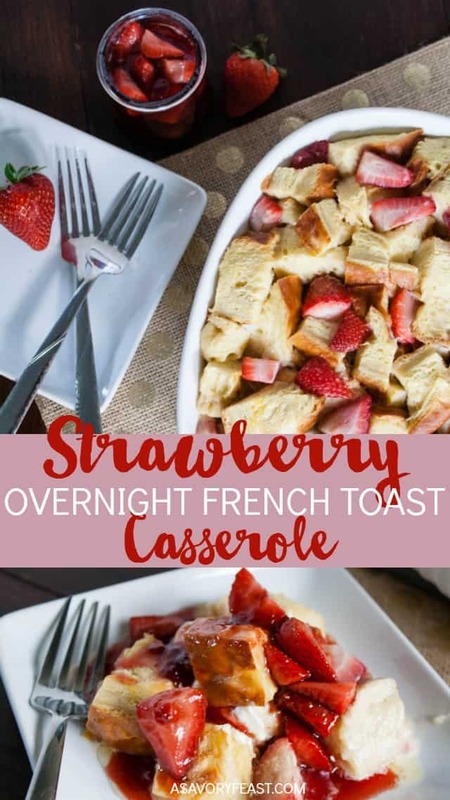 This looks beautiful – I have a couple of overnight french toast recipes but none with strawberries. It sounds delicious – pinning to my cooking bucket list and of course our Four Seasons bard. Thanks so much for joining us on the Four Seasons Blog Hop! Hope to see you again this week!